What did you finally come up with for your problem? We have tried all we can think of. Anything you can think of? When I was younger and marginally dumber, I shot several ill-fitting shotguns extensively. It was shooting at least three nights a week, under the lights, plus weekends. After a while, aside from perpetual chipmunk cheek and bleeding all over a variety of stocks, there was enough scar tissue inside that there was a knot that wouldn't go away. So, yes, Dr. Dave Felgenhauer went inside my mouth and did an expert job of digging out the scar tissue. The solution, for me, was getting rid of every single shotgun that didn't fit me perfectly and that was that. Even low or moderate recoiling shotguns can be real face-breakers. Before you do much of anything, you want to be sure that your husband is completely healed up. If you have even a slightly inflamed or sore cheek, it takes scant little to set the whole ordeal in motion once again. We've not met, but if his Caesar Guerini worked fine for two seasons and all of a sudden there is a problem, what changed? It sure sounds like something did. Cutting a bunch off the stock sounds like an overly aggressive fix to something that wasn't a problem for a couple of years. Has your husband ever had a professional stock-fitting? Rich Cole, of Cole Gunsmithing, is one of the best. Rich currently divides his time between his new Naples, Florida location and the original location in Harpswell, Maine. Cole Gunsmithing is also a Caesar Guerini dealer, they normally have a good supply of wood, and can make a custom stock if necessary. 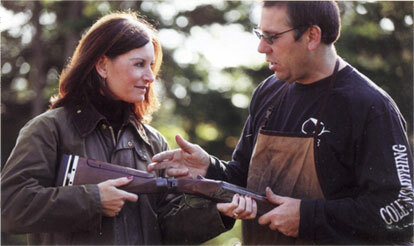 Caesar Guerini also does stock fitting. Both Rich Cole of Cole Gunsmithing and Wes Lang, President of Guerini USA attend several major shoots across the country every year as well. Whether a basic stock fitting or a complete custom stock for your Zoli, Caesar Guerini, Perazzi, or many Berettas: Cole Gunsmithing is currently the top choice. See: http://colegun.com . The cost of a stock-fitting from Rich Cole varies in concert with the amount that needs to be done. A basic stock-fitting might run $300 - $400. For a custom stock, made from scratch, that could be $2000 or so depending on the grade of wood that is selected. With a stock that has already been modified, it is hard to say. I'd contact Rich Cole directly to get an idea both of the cost and what would be most practical as far as logistics. Cole Gunsmithing can be contacted at Florida location: 239-352-0345 and Maine location : 207-833-5027 . So, for starters, let your husband heal up and you might want to make sure there is no current inflammation or any latent medical issues going on. After that, I'd get in touch with Rich Cole. It might be just a fitting, but if you need (or want) the custom stock treatment Cole Gunsmithing is set to do that as well for Antonio Zoli, Caesar Guerini, Perazzi, Beretta semi-automatics and 680 series over-and-under guns. Either way, Rich Cole can get it sorted. They have try guns and I believe you can do some shooting during the fitting process so at the end of the day, you're confident that things are right and when you leave, you know exactly what you are leaving with.